To most people, when you mention poppies, the drug opium comes to mind. However, we will not go there. We want to show you how to grow the lovely poppy to enjoy as an ornamental in your own back yard. Poppies belong to the plant family Papaveraceae which consists of about 700 annual and perennial species found growing wild in temperate regions of the Northern hemisphere. They are herbaceous plants which produce a sticky milky juice (latex). 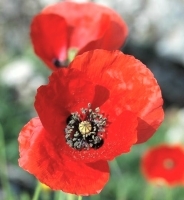 The so called 'corn poppy' is an annual of a brilliant scarlet color and grows wild in meadows and on hillsides in Europe. If you have never seen a meadow filled with naturalized poppies, you have missed one of nature's best. This species, along with other annual poppies will seed itself if left unattended and is a natural if you enjoy wildflowers. Poppies have been extensively hybridized to produce sturdy plants for your garden in a rainbow of available colors ranging from white to dark red as well as yellow to orange shades. With few exceptions, both annual and perennial types have bluish-green hairy foliage and stems. The flowers emerge in the spring from plump furry buds, one on top of each stem. Some flowers are double and ruffled, most all have a black 'eye'. Poppies are mostly raised from seed, but you may find some established plants available during the blooming season at your local garden center, or check the internet for plant outlets where you can obtain popular hybrid seedlings during the spring and fall. Poppies are among the easiest plants to grow. Most like it on the cool side. Ideal temperature zones for optimum growing conditions are 4 through 8, although you will be able to find some more cold tolerant as well as those that can withstand the heat of summer in the more southerly zones. If you have a bed of poppies and want to propagate, leave the bloom to produce pods. These will ripen and eventually turn dry. You can tell when the seed is ready to be harvested by shaking the pod. There will be a distinctive rattle, indicating that the seed is there. Pop open the pods and collect/store the tiny seed in a dry location until ready to plant. Sow seed of both the perennial and annual type (including California Poppy with its fernlike foliage) either in autumn or very early in the spring in full or partial sun. Select a well drained area. Cover with a thin layer of soil, tamp down and water in. If you are sowing in spring, keep reasonably moist until plantlets are up and growing. They all thrive in poor, rather than enriched soil and require little care once established. Do not fertilize if you expect flowers. If conditions are right, you may see a second blooming in the fall. Leave annual plants in place until late fall to ensure that seed capsules have dried and opened. You should have new seedlings the following spring and hopefully every spring thereafter. If grown for strictly ornamental use, you should deadhead the flowers and a second blooming may occur later in the season. Otherwise, you can leave the dead flowerheads and harvest the seed once the capsules are dry in late summer. There are many uses for poppy seed in cooking and especially baking recipes.